Step back, get out of the way - this is El Santo, he'll blow you away! Masked heroes were popular in the 1930s, the decade that saw the introduction of The Lone Ranger, The Green Hornet and Batman. In Mexico, crowds flocked to see masked combatants wrestle each other into submission, with each luchador giving such a theatrical performance that audiences knew who was the tecnico (good guy) and who was the rudo (villain). Most famous of all was El Santo, whose popularity inspired a comic book and, years later, a film series. Rodolfo Guzman Huerta, who portrayed El Santo in the ring, turned down an appearance in 1952’s El Mascadero De Plata (The Man In The Silver Mask), though he later relented and took supporting roles in Santo Vs The Evil Brain and Santo Vs The Infernal Men, initiating a franchise that lasted into the 1980s. By the time of Santo Vs The Zombies (1961), the formula had been established: in between wrestling matches, Santo helped the police solve a mystery, rescued a kidnapped friend from a supernatural antagonist and then returned to the ring as normality resumed. Whether encountering vampires, werewolves or mummies, though, Santo never met an opponent he couldn’t defeat with one-on-one grappling. 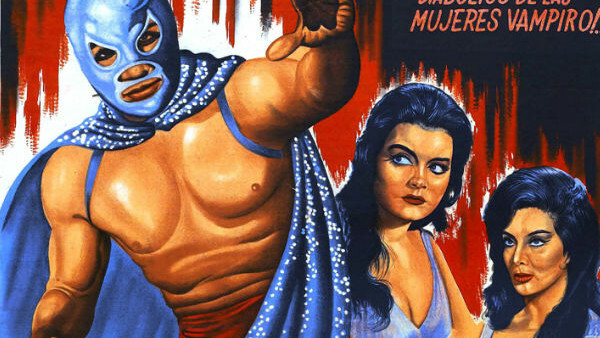 The films were made quickly and cheaply, and while a modern audience is more likely to be reminded of Adam West-era Batman, they were successful enough to open the floodgates for Mexico’s luchadoras (wrestling women) as well as various imitators. Here are the 10 pictures you need to check out.